The incidence of posterior cruciate ligament (PCL) injuries in isolation is uncommon, but rather more regularly found with concurrent injuries, while medial-sided injuries are the most frequent among knee structures. The medial collateral ligament (MCL), spanning between the medial aspect of the femur and tibia, consists of a superficial medial (tibial) collateral ligament (sMCL) and a deep medial collateral ligament (dMCL) and provides stabilization from abnormal valgus motion and internal/external rotation. The PCL is composed of two bundles, the anterolateral bundle (ALB) and the posteromedial bundle (PMB), and is the strongest of the intra-articular knee ligaments. The PCL predominantly provides restraint to posterior tibial translation and external/internal tibial rotation. The most effective means in determining MCL injury is by severity of medial joint space gapping by valgus stress testing; PCL deficiency is evaluated relative to the posterior sag sign, the quadriceps active test, and the posterior drawer test. Injuries to either the PCL or MCL (Grade III) are suggestive for reconstruction. In the instance of concomitant injuries, tunnel convergence is frequently encountered among the tunnels drilled per structure, and coronal angulation of 40° for the MCL tunnel is beneficial for avoidance of the PCL tunnels. Surgical techniques using anatomic procedures for attachment sites are the most effective means for subsequently restoring kinematics of the knee joint, ultimately yielding greater outcome scores. Although single-bundle (SB) reconstructions are able to restore subjective outcomes, a high incidence of osteoarthritis (OA) progression is seen in patient outcomes. 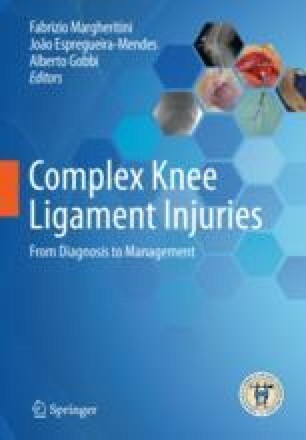 While double-bundle (DB) techniques show promising outcomes, long-term studies are needed to further define outcomes, as well as studies documenting treatment of concomitant MCL and PCL injuries.